How Much does It Cost to Make a Penny? 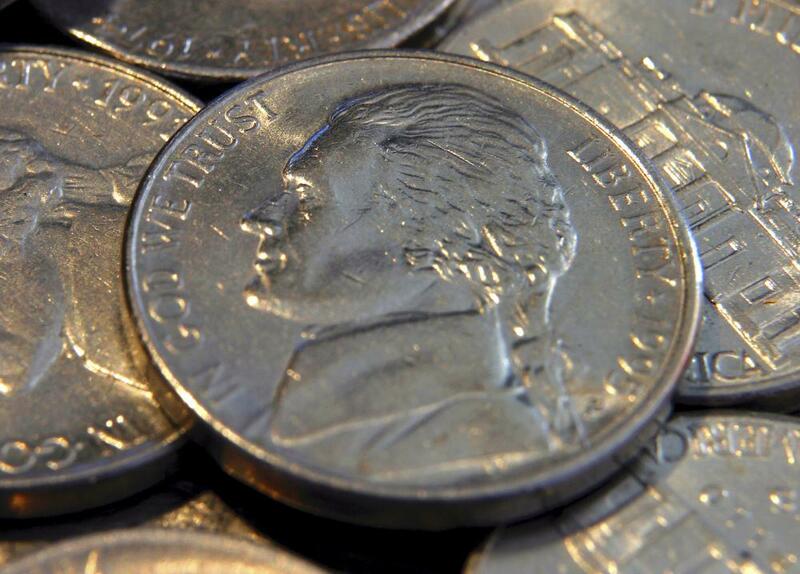 A nickel costs 11.14 cents to make. Front and back of a US penny. A stack of American coins. As of 2011, it costs 2.41¢ US (or $0.0241 US Dollars (USD)) to make a penny, making the coin's face value less than its actual value. The cost first exceeded the face value of pennies in 2006. The rising cost of making a penny has led to some serious reconsideration of the composition of the penny at the United States Mint, the government agency responsible for printing money and striking new coinage. The cost of a penny is largely dictated by the materials used to make it. Pennies contain 97.5% zinc, with 2.5% copper to give them their distinctive coppery color. Prices of these metals have risen dramatically in the early 21st century, in response to market demands and increasing regulation of mining, which has made the cost of metals extraction much higher. The obvious solution to make a penny less expensive is to change the composition of the coin, integrating cheaper metals or perhaps even plastics, as is done with some European currency. Attempts at changing the composition of the penny have met with some opposition, however, since some people are concerned that changes in the materials could change the look and feel of this iconic American coin. Others have suggested that it may be time to do away with the 1¢ piece altogether, a decision which would certainly change the way Americans do business. In addition to the penny, the nickel also has a physical value which is higher than its face value; nickels cost around 11.18¢ US to make. Other currency, such as dimes and quarters, costs much less to make. The face value of a quarter may be 25¢ US, but it only costs 11.14¢ US to make one. The relative high cost to make a penny or a nickel is balanced out by the lower costs of producing other coins, in some people's opinions. Changing commodities prices will continue to drive up the price of making pennies. It is unlikely that the cost of production will ever fall below 1¢, and with more pennies being made each year, the Mint may face some tough decisions. Like other government agencies, the Mint is expected to be financially accountable, and the business practice of distributing something with a value less than its manufacturing cost is not very sound. Whether Americans like it or not, this means that the penny and the nickel may be undergoing changes to address this issue. Changing the penny wouldn't be setting a precedent; in 1943, the mint coined pennies in steel, in response to wartime demand for copper. Is Spinning a Penny a Fair Way to Make a Random and Unbiased Decision? Where Is the Best Place to Find Loose Change? a Pound of Which Is worth More: Dimes or Quarters? What Does It Mean If Something Is a "Dime a Dozen"? What Is a Red Penny? What is a Gold Penny? What is a Silver Penny? Pennies are worthless trash anyway. Most people throw them away everywhere. Where I live there are pennies all over our parking lot all the time, and probably tons more in the dumpster. Get rid of them! Stop it. I love the penny. The person who calculated the cost at $1.4 billion was off by a factor of 100. The cost of making pennies exceeded their value by $14 million in 2008. Nickels are also more expensive to make than 5c each. Get rid of both of them and round to the nearest dime. Also, @post 21: Even if the rate was a flat 10 percent, the tax on 0.40 would be 4 cents, requiring pennies. The Australian guy has it right. Get rid of the pennies and nickels and round to the nearest 10 cents. There is no way it costs less and the reason for that is the person who helps make it is making a good wage. @anon208595: Various sales taxes don't make a difference to determine whether to use a penny or not. I lived in Australia for 14 years and didn't use a penny once. Why? Australia got rid of the penny decades ago. Anything that is 1 or 2 cents, like 31 cents or 52 cents is rounded down to 30 cents or 50 cents. Anything that is 3 cents or above is rounded up to the nearest 5 cents. 63 cents is rounded up to 65 cents. No hassle. Everyone agreed to it and it works great. @MooseDrink: I'm not too sure where you are getting your numbers. 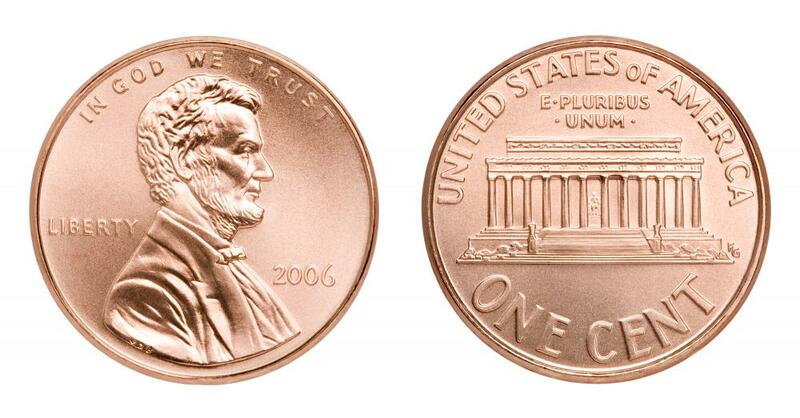 In the year of 2008, 5.4 billion (5,419,200,000) pennies were produced from the coin mints in the US. The reported cost of manufacturing one penny was ¢1.26 ($0.0126 US Dollars) Calculated out as follows = 5,419,200,000*¢1.26= ¢6,828,192,000= $68,21,920.00 spent in 2008 on making pennies. Your estimated annual savings of $1.404 billion is 2,056 percent higher than the actual figure for 2008. Quite a big difference. As long as individual states and cities impose variable sales taxes, there will always be a need for pennies. It seems like the only workable solution for that would be to force every state to adapt a flat 5 or 10 percent sales tax so the results would always be rounded to at least the nickel. I don't see that happening any time soon. When my own city raised its sales tax by one cent, people started shopping elsewhere. I'd be all for changing the composition of the penny in order to save money and still keep the idea of a penny around. These new coins wouldn't necessarily have to work in vending machines (most pennies don't, anyway), but they would still acknowledge payment of sales tax. Since most things cost at least a nickel these days, pennies really only serve that one purpose to begin with. Is it just me who thinks that the "cost of money" is sort of an oxymoron? All that really matters is that the "street value" of the raw material in a coin is less than the face value. E.g., if pennies were still made of copper, people would melt them down and sell them as raw copper and the government would be simply be selling copper refined copper below cost. no different than melting one down for its raw materials--it still has the same value as currency that it did the day it was minted. Actually that's not really true, is it? In fact, currency has no intrinsic value. Its value is determined only in use by what seeing what it can be traded for. When I was a kid, 5 cents USD could be traded for a Hershey bar. Haha! These days, 5 billion or so (the amount one poster contends could be saved per year by doing away with pennies) is economic noise. It sounds like a lot to an individual, but in aggregate, it really isn't much. The U.S. spends several times that and more per month on wars (not counting the fixed cost of maintaining a huge standing army to fight those wars). If you really want to complain about government wastefulness, how about going after all the billions we're handing over to Haliburton for wartime provisions. Sheesh! All that said, get rid of the darn coins already! All they do is take up space in my pockets until they fall out between the couch cushions. I have a simple partial solution. I use cash as little as possible (credit card transactions are a lot easier to track in my budget software) and when using it in any venue with a tip jar, leave the change in the jar. Oh, you can't quite manage to put yourself on the debit side of the tip jar equation? Guess that coinage is worth more to you than you let on then, eh? If creating a penny is costing more than what it is worth, than whats the point? We are technically throwing away money! Not to mention the resources to make the penny as well. If you ask me, we should get rid of the penny all together and round up or down. If we did this, we would save plenty of money and help with the national debt that we are in. $.0126 is 1.26 cents, so it is more than a penny to make a penny. american39, 1.26 cents to make a penny would be correct. if it was .0126 they wouldn't be losing money. Then I'd like to sell you my car for twice its worth, and you can use it as many times as you need to make you think that your poor investment is justified. In the meantime, I'll buy another of the same car for its actual worth, double my investment, and get the same amount of use out of the car as you. what the cost of production. So lower cost, or get rid of it. It's simple economics. And by simple I mean, although it is taught in any undergraduate level economics class, it has evaded notice to the American car companies, and now our govt. If you are making something that doesn't make a profit, DON'T make it. It isn't all that big of a deal once the concept of multiple use is grasped. Great points. And I like how you chose to state the issues rather than your opinions. But conclusions need decisions, and debate. I think you hit the penny right on the heads. In this economic downturn, getting rid of them would save us $5.4 billion x .26 = $1.404 billion annually. That kind of penny pinching goes a long way. For them to be effective, they should be used as often as their corresponding worth. They should be used 10 times as much as a dime, not 5. And 2 times the number of quarters means a quarter is worth much more (<17.5) as a unit of trade per cent. That's confusing. Allow me to demonstrate by example. Would you prefer 4 quarters, or a dollar? Quarters can be used as laundry money and in vending machines. Dollars are lighter to carry, and (although not waterproof) are accepted basically anywhere without argument. It's tough, but I think I'd prefer a dollar in my pocket. Now, which would you prefer, a dollar, or 100 pennies? A quarter, or 25 pennies? No contest. How about a dime? Nickel? Or better yet, a dollar, or 101 pennies? I think most people at a checkout counter would prefer the convenience over the penny profit. Also, there is a difference between most produced and most popular. Pennies are so prevalent and worthless that they litter the streets and sit in piles at any gas station (give one, take one). I've even had "penniless" homeless people scoff at me for giving pennies to them. If you value the currency, you'd hold onto it. One reason they are produced more is because you can throw them away with no remorse. They're practically free. As for the current sales tax structure, here's a simple solution: round up. And the fact that we did have smaller currencies than the penny and don't anymore just furthers the idea that the penny is past its time. But if none of this swayed you, let's go to the most basic analysis. What can you buy for a penny? I'm hard pressed to find anything. I've even been to a penny candy store (also hard pressed to find as they've been replaced by the dollar store) and not found a piece worth that a penny. If you can't use one to buy anything, why have one at all? I just read that the penny is the most popular American coin. 5.4 billion pennies were made in 2008, for example. That's more than double the amount of quarters and more than 5 times the amount of dimes made. With such high numbers, it doesn't seem like it's going away; especially if the Mint developed new designs in 2009.
outweighs the extra cost to making them. Also, aren't they required given our sales tax structure -- because sales tax takes things to an unrounded final cost. Taking away the penny isn't as simple as it might seem at first glance. Another point: did you know merchants don't have to accept all forms of payment, even legal tender? So some store owners can, and have, refused to accept pennies. They, of course, have to modify the costs of their goods and services so that with the sales tax the amount comes to a multiple of 5. I guess the people could effectively make the need for pennies non-existent. Finally: Did you know, in the early days of the US, there was a "mill" -- a coin worth one tenth of one penny (i.e., $0.001 or 0.10¢ US)?! I actually agree with your analysis of depictions of modern capitalism. I'm for free-market capitalism in a society far different than the one existing now. Economics aside, it makes no sense to print a currency that isn't even worth the time to bend over to pick up. Economics should dictate what we do, but that's assuming we're a capitalistic society, and are logical. Seeing as we call our most capitalistic icon the "free" market, yet paid $850+ billion into it in tax dollars, it is not a free market, and our persona of capitalism is about as accurate as thinking we live in a capitalistic society that has social security. this too. I'd love to see the headlines, "US Mint goes bankrupt." How would they get the money to print more money?! That's just hilarious. If there are 100 cents in 1 dollar, then there are 1.26 cents in 0.0126 dollars. ¢ and $ are different symbols. It's like saying 0.01cm=0.01m. I'm not sure I understand what you mean American39. I would agree with you, though in this conversation I am referring to America as opposed to Australia, and you are from Australia is that correct? I don't believe that government will ever just 'not care' about the economy and decisions made for it, but it all depends on how the decision will support or not support the state. Taking the penny: will this effect positively how and what people think and see the state as, or will it effect it negatively? I would submit that most if not every decision made by governments can and is easily a detriment to the people and the economy as long as it supports the state. The penny can be outdated and of no use to anyone, but if it has a use or a purpose for the state, it stays. OK, try this then $0.0126 for the correct way to enter digital monetary values. ...you are wrong...wisegeek clearly posted the "cent" sign, and not the "dollar" sign...making the statement correct..
Now to my opinion.....the penny, nickel, dime *and* 1/2 dollar and dollar coin should be discontinued...there should only be quarters...all merchants have to do is round up or down...very simple, and everything will even out financially. The text display of c1.26US is not correct. The decimal is misplaced by 2 positions. In Australia, we did away with our 1 and 2 cent coins years ago. Everything gets rounded up and down. No complaints. It all works out. the cost of a penny leaves me to believe that no one in our government really does not care about our economy and will continue to waste money on something that is outdated and of no use to anyone.